It’s our assessment as camp operators, coaches, and most importantly parents - that as children grow through the ages of 3 to 5 years old, they generally don't understand the benefits of learning a skill nor do they associate any benefits with being good at something. Children are totally geared to develop through interaction with other children. It’s our intent to motivate children with fun games using size 3 soccer balls and related equipment. A variety of fun games to develop balance, movement, and motor skills as well as listening to instructions, quick pace throughout and fun. The progression class from the Comets. More challenging skills and new concepts are introduced. The emphasis is on individual motor skill development, fitness and ball control skills. Instructional Leagues offered on Fridays. To see our full offering of programming for this age, please check Friday Night Instructional Soccer Leagues. "M. has been playing with the Asteroids since the fall, and just loves it. As a mom, I am loving watching him learn the skills and am so happy to see him progress. I think it's great that you're not playing actual games. My stepdaughter (who's now 16) played soccer at 5, and it was a little heard of kids moving from one side of the field to the other in a swarm, with no clue what they were doing. Matthew is being taught skills and moves that he can carry with him should he continue with soccer and I think it's a GREAT program you have! It's also been helpful for me to watch him in action with the other kids and the coaches. Sitting on the sidelines, I'm able to compare his behavior to others his age in terms of his ability to follow directions and stay focused. It's helping me make the decision whether to start kindergarten in the fall. I feel it's a great bang for my buck! Thanks for all you do!" For soccer players looking to graduate from recreational to travel soccer, this is the training you'll need for the next big step. 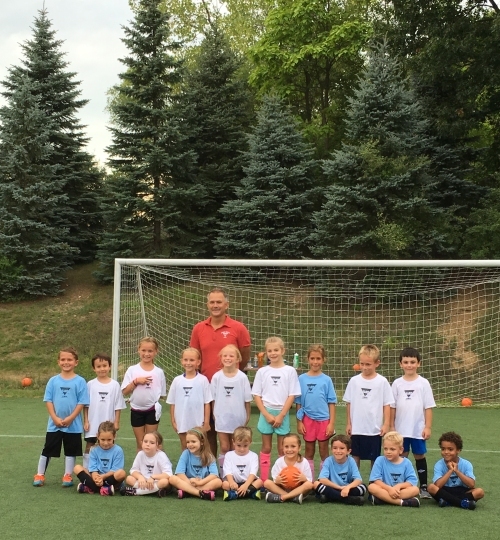 Join Friday instructional soccer director Philip Douse as he leads this new, more advanced soccer instructional program for boys and girls grades 3rd – 5th. This program will use a full 8v8 field (75 yards long) for 90 minutes every other Friday night throughout the winter. Coach Douse will coach on the field throughout the 90 minutes. Our Friday night sports program gives girls and boys the chance to participate in a very cool sport in a no-pressure, fun, instructional setting. Both programs (K/1 and 2/3rd) have limited space - K/1 has a max registration of 28, our 2/3rd grade has a max registration of 22 kids. All children are given matching game shirts week #1, they are then warmed up, given the game rules, and then game play starts immediately thereafter on week #1. Both programs use playing bibs, the K/1 program divides the kids into 4 teams, the 2/3 divide into 2 teams. The K/1 teams play 3 games against new opponents over the hour in between quick drink breaks using small goals with goalies. The 2/3 kids divide in half each week and play one game with a half time with larger goals. All teams are shuffled weekly. Team roster requests are not accepted throughout these indoor sessions. The first meeting of six will be used as a ball control, skill session, and icebreaker. Games start week #2. Team rosters are capped at 12 kids per team. Putting kids together on the same team (friends, family, car pooling) is a priority. Instructions on how to get kids together are passed out week #1. These two sessions are run (K/1 & 2nd/3rd grade) like a league. The K/1 program has a max registration of 72 kids / 6 teams of 12 kids per. A schedule for the 6 teams is built after week #1 using three time slots for the games: 5:30, 6:30, 7:30 pm. The teams rotate between all game start times. Parents need to be able to make all three slots (one game per week only – two 25 minute half’s). The team your child plays for might play at 5:30 week #1, then 7:30 week #2, etc.... The schedule is built and posted after the first meeting date, then loaded on our web site. There are no play-offs. The 2nd/3rd grade program utilizes 6:00 and 7:00 pm start times, and has a program max registration of 48 kids only - four teams of 12. All programs are open to both boys and girls. Team shirt is included and distributed to all kids on week #2. Families can contact the league director with questions or team placement requests. All registered participants (K/1 and 2/3rd) should be at OYA on the first night of play (5/20 for session 4) or (7/15 for session 5) by 6pm.